The recent cyber attack on Bangladesh's central bank that let hackers stole over $80 Million from the institutes' Federal Reserve bank account was reportedly caused due to the Malware installed on the Bank's computer systems. Few days ago, reports emerged of a group of unknown hackers that broke into Bangladesh's central bank, obtained credentials needed for payment transfers from Federal Reserve Bank of New York and then transferred large sums to fraudulent accounts based in the Philippines and Sri Lanka. The criminal group was able to steal a total value of about $81 Million from the Federal Reserve's Bangladesh account through a series of fraudulent transactions, but a typo in some transaction prevented a further $850 Million Heist. 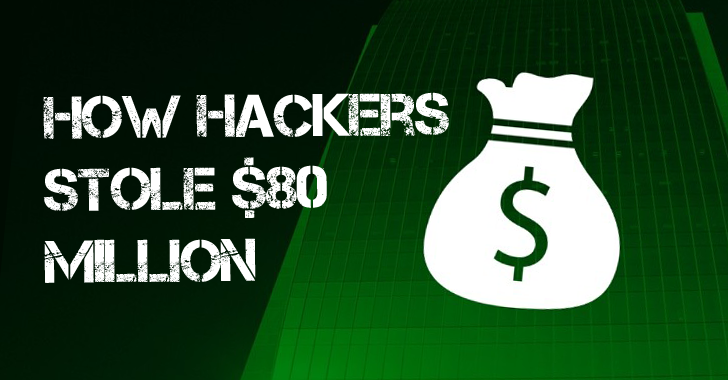 How the Hackers managed to transfer $80 Million without leaving any Trace? Security researchers from FireEye's Mandiant forensics are helping the Dhaka investigators to investigate the cyber heist. Investigators believe unknown hackers installed some type of malware in the Bangladesh central bank's computer systems few weeks before the heist and watched how to withdraw money from its United States account, Reuters reports. Although the malware type has not been identified, the malicious software likely included spying programs that let the group learn how money was processed, sent and received. The malware in question could be a potential Remote Access Trojan (RAT) or a similar form of spyware that gave attackers the ability to gain remote control of the bank's computer. The investigators suspect the hack could have exploited a "zero-day" flaw as they are unknown to vendors as well. After this, the hackers were able to steal the Bangladesh Bank's credentials for the SWIFT messaging system, a highly secure financial messaging system utilized by banks worldwide to communicate with each other. "SWIFT and the Central Bank of Bangladesh are working together to resolve an internal operational issue at the central bank," Belgium-based SWIFT said in a statement Friday. "SWIFT's core messaging services were not impacted by the issue and continued to work as normal." Security experts hope that the malware sample will be made available to the security researchers soon so that they can determine whether the sample was truly advanced, or if Bangladesh Central Bank's security protection was not robust enough to prevent the hack. The Bangladesh Bank discovered weaknesses in its systems, which could take years to repair the issues though the Federal bank has denied any system compromise.